Editor’s note: chocolate is HIGHLY toxic to dogs. If you suspect your dog has ingested chocolate, please contact your emergency vet immediately. Dark chocolate is highly toxic to dogs. They can eat a lot of milk chocolate and be fine. But dark chocolate and more specifically bakers chocolate can kill them. Can’t imagine the rum would be any too good for them either! My daughter had a dog that would, if the table was not immediately cleared, climb OVER the remnants of lunch to reach the chocolate chip cookies in the middle of the table. And look completely innocent when we’d reenter the room. 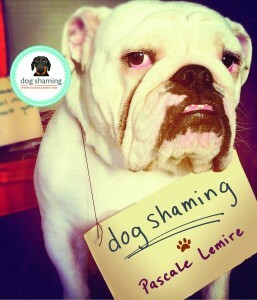 Fortunately for Gracie, this was before the advent of “Dog Shaming”!! About 25g of 70% dark chocolate can kill a 20lb terrier….that’s just a bit bigger than a playing card. Don’t take a chance. When people tell stories of all the stuff their dog has eaten & survived it’s generally big dogs & milk chocolate, or chocolate covered things. I had a friend whose rather large dog managed to eat an entire chocolate cake, with chocolate frosting, and followed it with a bag of chocolate chips. He got to visit the vet and eat the black candy there. Been through this night mare twice! my English Bull dog polished off the whole family’s Easter egg hoard one year which resulted in an over night stay at the vet, sedated and on a drip till they got her temperature under control and re-hydrated. The second time she managed to eat a whole chocolate fruit cake made by friends, the daft mutt ended up with both chocolate and raisin poisoning. That was a week at the vets, they even told us to bring the kids in to say good bye as her bloods showed the onset of organ failure 🙁 Thankfully she rallied and we had her her for another couple of years….sadly we lost her just over a year ago to Lymphomia, had a known about this site then she would have made regular appearances on it 😀 Life is a lot less stressful without her but definitely a lot poorer for it. 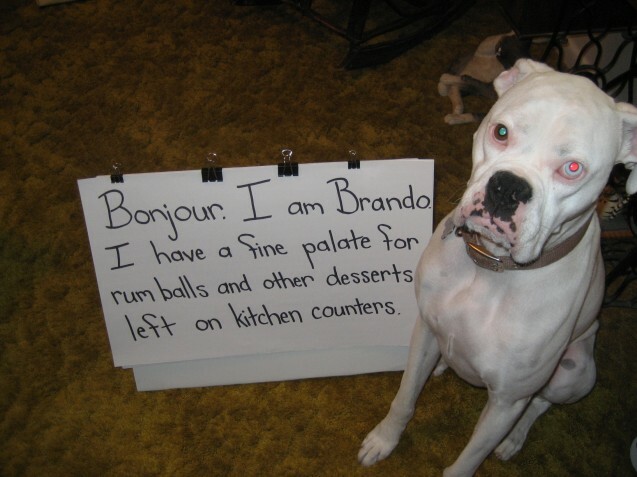 I am Brando’s mum, and he eats anything…concrete, light bulb…and the rum balls. Has survived it all, but had a hard time digesting an insulated lunch bag about a month ago….had to have surgery. He is doing well now and has to be watched like a hawk! But we love him! That said, I *highly* recommend the ASPCA’s poison control hotline at 888-426-4435 (info at http://www.aspca.org/Pet-care/poison-control/what-to-do-if-your-pet-is-poisoned). I’ve used them a few times–including the time our dog at an entire package of dark chocolate chips–and they are amazing. Esp. useful to people who might not have an emergency vet nearby. Each time we’ve called us they’ve talked us through inducing vomiting in our dog (fun! ), and counseled on what symptoms to watch out for and if/when we’d need to go to a vet. There’s a fee, but it’s reasonable and SO worthwhile.